It’s interesting, the only time of year when giving is heavily promoted is the holidays. People often overspend and get into debt around this time of year so it can often make the giving experience seem negative or not worth it. However, giving is a great way to help others and also help yourself as well. It can make someone’s day and make you feel better. 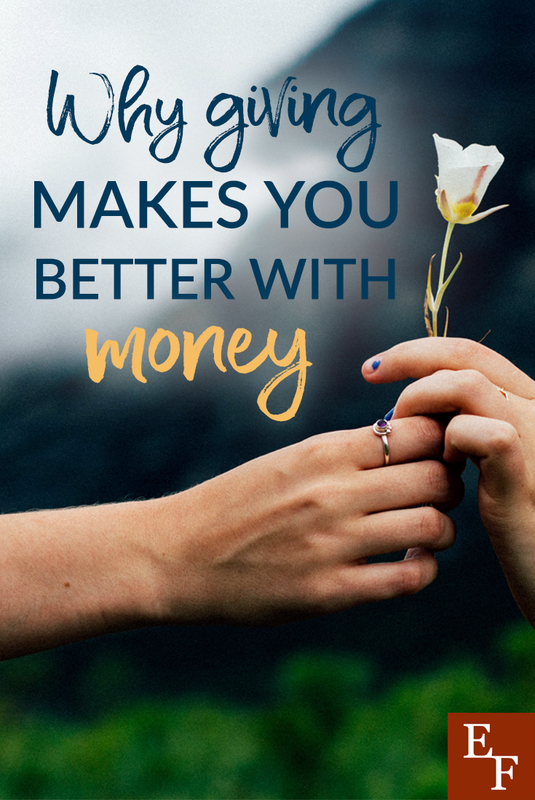 Giving can even help you become better with money. Yes, it’s true. When I was deep in debt and struggling, I couldn’t begin to think about giving to others. I had to feed myself and take care of my family first. So I started giving with my time. Then I started giving with actual dollars and keeping the amounts small. As time went on, my giving increased and my financial situation got better. What does money do for you? Why do you want it so bad that you go to work every day faithfully to ensure you earn it? Why do you get excited when you get a raise at work or an extra stream of income? It’s probably because you have a whole list of things you want to buy with your money. Whether it’s food, bills, rent, or entertainment, we all tend to find a general purpose for our money. Giving simply provides another purpose for money – and it’s a much more worthy purpose if you ask me. Here’s the thing, no matter where you think you stand financially, there is always someone doing worse. There are always great causes and missions to support. If you’re religious, there’s always a faithful ministry doing great things in the community that you can help support. When you prioritize giving, it often makes you feel better about yourself and your finances because you’re doing something worthwhile. You’re making a difference with your money. Using money for your own purposes is find and is something you should prioritize first. However, you can still give small amounts to causes you care about and really make a difference in the world. When you do this, you have something to show for your money and for yourself. A lot of us approach money from the perspective that we never tend to have enough. This is what I used to tell myself whenever I’d walk past a homeless person or see a really touching Go Fund Me account. Sure, I can’t give money to every cause I care about and find important, but I eventually realized that I was deciding not to give from a place of scarcity. I asked myself: What would really happen if I gave this homeless man the $5 bill in wallet? Would it really set us back that much? The answer was always no. In fact, I never even missed small amounts of money I gave away occasionally to people who were in need. In fact, it helped my mindset. I love budgeting and being realistic about my finances, but I also know that you can easily take it too far. When you hoard your money and constantly tell yourself you can’t afford this or that, you basically tell the universe that you don’t expect to receive any more money than you have currently. You basically imply that you can’t handle the money you have now and you don’t need anymore. When you give intentionally you are telling the universe that you have plenty of money – so much that you can even give a little extra. You also imply that it’s okay to get rid of some of your money because you expect it to come back. You can always make more money, but when you operate from a place of scarcity, you’ll never be able to see and grasp all the additional money that your future holds. A surprising number of Americans don’t feel confident about their finances. It’s not an understatement to say that giving can help you feel happier and more confident as long as you give with the right attitude. Giving naturally makes you feel good and when you donate to charities and causes you care about, you feel confident knowing that you’re helping improve someone else’s life. When you realize that being able to give money allows you to do this, you’ll fee more confident about your finances in general. Not only can you help yourself and take care of your loved ones, but you can also help other people. Essentially, your money is now bigger than you and it can do more than you may have ever expected. This new confidence boost is an instant reward that will make you feel better about money. As a result, you’ll have the motivation you need to give you the motivation you need to manage your money properly and meet your own financial goals. Your situation doesn’t have to be perfect for you to start giving. It starts with your mindset. Think from a place of abundance rather than scarcity. Instead of thinking about what you don’t have, think about what you do have to give. It may take some time for you to get comfortable with giving money. Start small and give your time if you can. Volunteer at a shelter or a facility that has a mission you care about. Once you start to see the impact of your giving, find a way to donate. Give to the homeless. Provide a one-time donation to victims of a natural disaster. Or, give by supporting a small business in the area. Give to a creative entrepreneur. I follow this one YouTuber and really enjoy her content so I donate $5 per month to her Patreon account. This helps fund her business expenses so she can keep producing awesome YouTube content. Giving that $5 per month does not set me back financially at all and it actually helps me feel more confident about money and how I manage it. Now I want to hear from you. Do you make it a regular habit to give despite what your financial situation looks like? Have you ever experienced these benefits of giving?